Let’s start off with a non-macro image: morning sun on the Colorado Rockies. As promised, here’s a follow-up to my macro series. Rails (or sliders) are devices that allow small movements of your camera without having to move the tripod. The heart of a rail is its gear/screw mechanism, and the quality of the rail is in how finely this part is made. This post also aims to give a step by step on setting up a macro shot, whether or not you’re using a rail. Of course I don’t always follow this exact procedure. In photography like a lot of things there’s always “more than one way to skin the cat”. Sorry cat lovers! BUYING A RAIL: As always with photo accessories, you have to be careful buying cheap. Check out rails in the shop if at all possible, using your camera and macro lens to see how they work under load. Or if you can’t do that just go a bit more expensive for something with good reviews online. I bought a medium-quality one. It’s fine but would not be okay if I used it a lot; I use it very infrequently. I spent about $50 on it. Here are the things to look for in a rail. If when it is mounted with the camera on top the rail wiggles around, even a small amount, it’s obviously no good for macro. And if movement along the screw & gear is not slow and steady enough, that rail is probably not worth buying. A SMALL CAVEAT: I chose a very simple shot for an example. 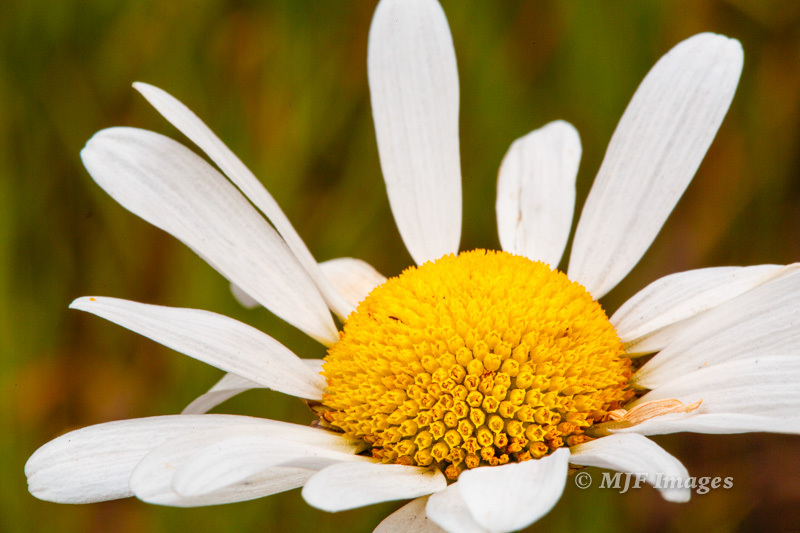 In other words, it’s not the most spectacular subject, just a little flower in the weeds. Also, the close-ups of my camera make it look like I’ve beaten it to hell. It’s not actually that bad, honest. The crack you see isn’t the LCD screen itself, it’s the protective cover. Okay, I admit it, I’m hard on my gear. By the way, I made sure to pick a good day for this (photo below). Notice the boring white cloud cover, mid-morning, really perfect for what I call “illustrative” macro. That means no real shadows or directional light. Each rail works a little differently, but what follows is how mine works. It’s pretty typical. There is an Arca-Swiss plate screwed to the bottom of the rail assembly, so the whole rail mounts right on top of the ball-head (see pictures below). This isn’t the place to discuss tripod heads, but make sure you always get plates that match your head’s clamp. Arca-Swiss is sorta the standard, and is pretty simple to use. Rail clamped down on ball-head. Make sure the rail is set somewhere in the middle of its range (rotate the knob to slide it). If it’s at one end of its range you won’t have flexibility to adjust it in one direction. The picture above shows mine a bit too far forward, so I had to slide it to the middle part of its range. Once the rail is mounted securely go ahead and screw your camera right down onto the top plate as shown below. This setup allows the whole rail/camera assembly to rotate around with the ball-head. Screw the camera down onto the top plate of the rail. My tripod allows me to go lower by rotating the center column to horizontal. Now it’s time to set up the camera. Go to manual focus and pre-focus so your subject is in approximate focus (see pictures below). Use either the viewfinder or LiveView for this step, whichever is easiest for you. Again, don’t worry if it’s not perfect. If you want to get as close as possible and fill the frame as much as possible, as I’m doing here, pre-set the focus ring to the smallest focal length. 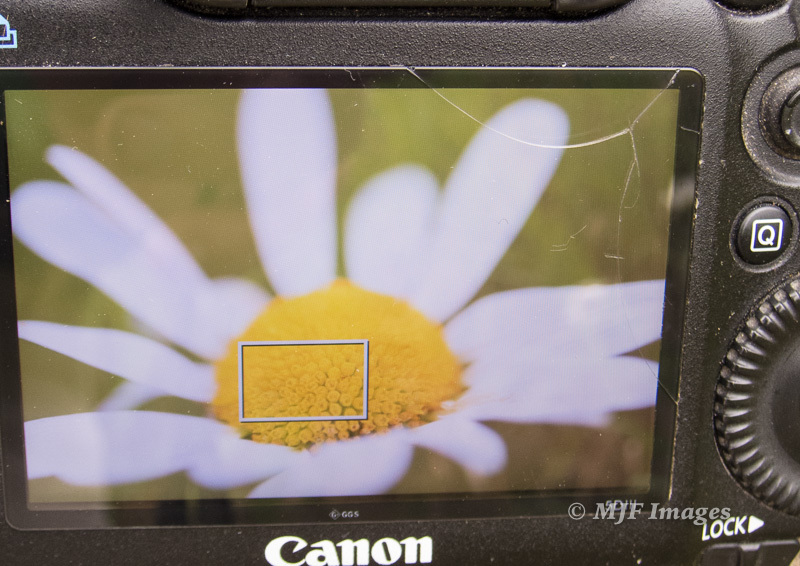 But if you do this, re-check your tripod position and make sure it’s positioned so your lens is no closer to the subject than this smallest focal length (about a foot with my macro lens (see pic below). Pre-setting focus at the shortest focal length. Now you can slide the camera closer or further along the screws on the rail, turning the knob as shown. Your focus is pre-set. Moving the knob on the rail is the way you are focusing now. I recommend using LiveView and magnifying as necessary to focus on the exact part of the subject you want in perfect focus. …watch LiveView for the part of the subject you want to come into perfect focus. Still in LiveView, I magnified on the flower’s yellow center and adjusted the knob on the rail to focus precisely. You can also use the rail at this point to fill the frame more or back off and show a little more surroundings. In other words, change the composition. So if while you’re sliding the camera along the rail you get a composition you like but you’re not in focus, go ahead and rotate the camera’s focus ring to get perfect focus. See the Bonus below for more on focus and depth of field. While you’re at it and have LiveView up, you should check exposure before taking the picture. On my camera I press the “info” button to pull up the histogram (see below). In this case, with a white flower, I pay attention to the right end. I want to avoid the peak on the right climbing up the right side, causing over-exposure. But I don’t want that peak to move too far toward the center. That would underexpose and make the white petals look gray. When using LiveView to check exposure, make sure your camera’s LiveView setting is on “Exposure Simulation” (check your owner’s manual). LiveView with histogram. The histogram reads what is inside the white box, and I’m over-exposing the yellow just 1/3 stop. When I moved the box over to the petals, the histogram’s right peak slid over to the right, but not quite all the way to the right edge (which would have meant over-exposure). Some rails only have one screw/gear setup to move forward and back. Mine also has a screw and gear at right angles to allow small movements right and left. This can be handy to get slightly different compositions, with your subject off to one side. I can remove that part to go lighter (see images below). With my rail I also get a more stable camera mount (no wiggle) when I get rid of that extra part. Using the side-to-side adjustment knob to move the flower off-center. I slid the rail/camera slightly to the left, which put the flower just off to the right. This still needs a little tweaking in the computer, but this isn’t a bad final image. Rail with side-to-side part removed, leaving only the forward-back adjustment. My hands are starting to look like my mom’s! DEPTH OF FIELD & MACRO: Macro lenses have very little depth of field in front of the focal plane, with much more (but still limited) in back. In other words, you will normally focus on the closest important part of the subject, not trusting anything closer than that to be in focus. Then you’ll play with aperture, experimenting to get the right amount of depth of field. Remember also that the closer you get to your subject, the narrower your depth of field will be, and the reverse is also true. Get more depth of field by moving back away from your subject. DEPTH OF FIELD PREVIEW BUTTON: You can either shoot and review to experiment, or use LiveView in combination with the depth of field (DOF) preview button. Not all cameras have a DOF preview button. If yours does, there are times when it comes in very handy. Pressing the DOF preview button closes down the aperture to the one you select (see pic below). Otherwise anything you see through the lens, either using the viewfinder or on LiveView, reflects the lens’s widest aperture (shallowest depth of field). LiveView without the DOF preview button depressed. Even though my aperture is set to f/11 here, the LiveView shows what it would look like at f/2.8, the largest aperture for this lens. Here I’m pressing the DOF preview button to see what f/11 actually looks like. The petals in rear are in better focus than in the LiveView image above. APERTURE: Realize as you close down aperture for more depth of field you are doing two important things to the picture. First, you are slowing down shutter speed. So if your subject is moving, for example in a breeze as mine is doing here, you may end up blurring your subject. Raise ISO to keep your shutter speeds fast enough to freeze that movement and avoid subject blur. The only way to see how much you need to raise ISO and check for blurring is to shoot and review. It also pays to watch closely for the subject’s least amount of movement and shoot then. If your shutter speed is fast enough (about 1/100 sec. or faster for this lens), you can just press the shutter gently. If speeds are much slower, you need to keep your hands off the camera, using either a remote switch or shutter delay. At f/11 and ISO 100, shutter speed is 1/25 sec., which will result in a sharp picture if I wait for the breeze to pause and the flower to be mostly still. But I wanted more depth of field so I went to f/22. I had to raise ISO to keep shutter speed up. If I had more wind (or less patience) I’d need to raise ISO even more. The second thing you’re doing when adjusting aperture for more depth of field is of course bringing the background into better focus. Use the DOF preview button or shoot/review to get just the right balance between focus in your subject and the amount of detail in the background. I slid the rail/camera slightly to the left, which put the flower just off to the right. This needs a little tweaking on color and contrast, but it’s not a bad final image. Phew! That’s enough for now. If all this sounds too complicated to bother with, please don’t despair. It’s actually much simpler than it appears. Try re-reading this. But really, you just have to play around with the rail and see how it works. It also helps to get some practice shooting macro before adding a rail into the mix. As mentioned in the last post, rails come into their own mostly when you are shooting very close with high magnifications. I’d recommend skipping them when you’re doing “less-close” close-up photography. Blooming lupine is decorated in dewdrops at Mount Rainier National Park, Washington.